The New York Islanders have acquired the rights to defenseman Christian Ehrhoff from the Vancouver Canucks in exchange for the Islanders fourth round selection in the 2012 NHL Entry Draft. Ehrhoff completed his second full season with Vancouver in 2010-11 playing in 79 games. The Moers, Germany native tied his career high for goals (14) and set career high numbers in assists (36) and points (50) last season. 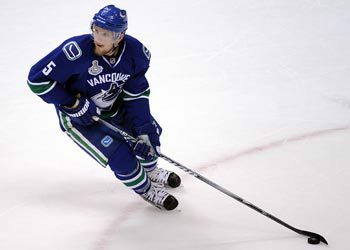 During the Canucks run to the Stanley Cup Final, Ehrhoff played in 23 games, scoring two goals and 10 assists for 12 points. Ehrhoff totaled 94 points (28 goals and 66 assists) in 159 games with Vancouver. The 6’2, 203 pound defenseman was selected by the San Jose Sharks in the fourth round (106 overall) of the 2001 NHL Entry Draft. He played in 341 career games with the Sharks over five seasons, tallying 25 goals and 107 assists for 132 points. Ehrhoff represented his home country, Germany, at the past two Winter Olympic Games. In the 2006 Winter Olympic Games, he registered two points (one goal and one assist) in five games and in the 2010 Olympic Games, Ehrhoff played in four games.